It’s something we knew would happen eventually but Nintendo has confirmed that some Nintendo Switch games will soon require the use of a microSD card in order to access all of their content. One such game is NBA 2K18. Nintendo has said games that have this limitation will be clearly labelled – now on the game’s box there’ll be a large white space on both the front and back stating that an internet download and microSD card will be required. 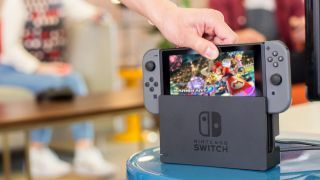 In a statement to IGN, Nintendo of America confirmed that while a microSD card will be required to access the full game, those who purchase a game and don’t have a microSD card immediately to hand will still be able to play small sections of the game. “If you purchase a physical version of a game that requires an additional microSD memory card, you will be able to play a portion of the game right out of the box (for example, specific levels or modes),” the representative said. The confirmation aligned neatly with Nintendo’s announcement that it’s partnering with SanDisk to release a collection of Nintendo Switch branded microSDXC cards in 64GB and 128GB sizes. If you’re less bothered about branding, though, and you plan to be loading your Switch up with a lot of games it might be worth considering the mammoth 400GB microSDXC card Western Digital announced at this year’s IFA. It admittedly has an eye-watering recommended price of £225 (around $290, AU$370) which makes it close to buying a second Switch. However, given that the Switch can support card sizes up to 2TB and this is currently the largest card in the world it’s an appealing option for those who don’t want to have a library of microSD cards replace what was once a library of physical games.